On July 17, 1955, Disneyland opened its gates to the public for the first time. Opening day had its share of mishaps and technical hiccups, as would be expected of such an ambitious undertaking. Ultimately nobody seemed to mind, and the theme park was celebrated as a sensational success. The Disney theme park empire has only grown since then, with the original Anaheim attraction followed by the mammoth Disney World in Orlando, and international parks in Paris, Tokyo, and Hong Kong. Just earlier this week the company released new details about the staggeringly ambitious Shanghai Disneyland resort, expected to open next year. In 2005, I was in attendance July 17th for the 50th anniversary celebrations at Disneyland. At the time I lived in Southern California, and even held an “annual passport” ticket that entitles the holder to multiple admissions for a year (not valid for admittance on the day of the anniversary, however). My then-girlfriend and I purchased our passes together, and made good use of them; we often boasted that the passports had paid for themselves several times over before they expired. For a while we managed a trip to the park every other Saturday. We spent so much time in Fantasyland we began to feel like citizens of the Magic Kingdom. Of course, Disneyland doesn’t have citizens; it’s not a real town, there are neither residents nor residences (although Walt did keep an apartment in the Main Street fire station during the park’s construction). In Disneyland, everyone is a tourist (or an on-the-job employee, of course). For most people, a visit to a Disney park is a special occasion, maybe an annual event, perhaps even a once-in-a-lifetime vacation. Our regular visits afforded us the luxury of feeling familiar, being able to skip the overcrowded big attractions to discover something off the beaten path instead. Evincing a disdain for tourists that would rival any New Yorker, we weaved through slow moving crowds of gawkers and In a fake city, we really felt like locals. Today is the 60th anniversary of Disneyland’s opening, and the occasion has prompted me to reflect on my experiences in Disney’s theme parks in light of my developing thoughts on urbanism. I’ve spent the past year immersed in literature on urban history, planning, and theory. Disneyland occupies a strange position in the world of urbanism. On one hand, the park has been acclaimed by planners and laypeople alike for embodying the principles of good urban design; on the other hand, its been decried for promoting the spread of cheap and generic environments, a corporate commercialized culture creeping beyond the theme park walls into the surrounding society. Looking back at my own experience, I had a surprising realization: Disneyland is where I learned to care about urban space. This will seem a sacrilegious sentiment to some, but as unbelievable as it may seem, it’s true for me. Recalling Baudrillard’s oft-cited claim that Disneyland’s artificiality mirrors the falseness of the surrounding civilization, it was within a simulated city that I came to appreciate the built environment. So inspired by this revelation, and in commemoration the park’s birthday, I have compiled the following list of five urban truths I learned at Disneyland. Transportation is a crucial element of city life, and a huge issue in urbanism. Urban planners are so passionate about transport that there are books, web sites, and podcasts devoted exclusively to the subject. Of course, this is just stating the obvious; consider how contentious the clashes between the entrenched transportation industry and “rideshare” newcomers like Uber and Lyft, or the clamor for bike shares and light rail in your own city. Modes of transport are so integral to the urban experience, that certain cities can be defined by the transportation they are most associated with. Yes, there are elevated trains, double-decker buses, yellow cabs, and cloverleaf freeway interchanges in many cities, but the association is strong enough that each of these transport infrastructures can serve as a synecdoche for an entire city (Chicago, London, New York, and Los Angeles, for those comparing notes). Transportation is a big deal in Disneyland, too. Walt Disney loved model train sets. So much so, he built a railroad in the backyard of his Los Angeles home. Dubbed the Carolwood Pacific Railroad, it featured a steam-powered locomotive large enough that his children and their friends could ride it around the yard. That’s a big toy train set by any rubric, but Walt dreamed of an even bigger set. The Carolwood Pacific Railroad was a key inspiration for the building of Disneyland; the park is encircled by train tracks, and could be considered the largest model train set ever built. Even if a visitor does not include a ride on the Disneyland Rail Road on their itinerary, the prominence of the train’s place in the park cannot be missed: the Main Street train station is the first building guests see upon entering through the main gates. The Disneyland Rail Road is just the tip of the transportation iceberg. The original Disneyland parking lot was just outside the main gates; visitors could see Sleeping Beauty castle from their parking spot. Today visitors park in a humongous parking garage and ride a tram to the front gates, since the original parking lot is now the site of the California Adventure park (appropriately, the Golden State-themed amusement park has an entire area dedicated to California’s car culture: Cars Land). Disney World ups the ante even further: from the parking lot, you approach the Magic Kingdom via the Monorail. These specialized methods of arriving at the gates convey the sense that you are transitioning from the mundane world, and prepare you for a special experience. Aside from the Disneyland Rail Road and Monorail, classic attractions included the Autopia go-kart course, the Skyway tram, and the literally-named People Mover. All these options allow visitors to experience Disneyland at different speeds, different scales, and from different perspectives. How you move through a space will affect your experience of that space, as well as how life develops within it. Street layout, transportation infrastructure, and accessibility obviously impact urban life in many important ways. What I am trying to evoke in this urban truth is something fundamentally experiential, even phenomenological. In several cities in which I’ve lived, I’ve had the experience of walking along a street on which I had previously only driven through. Even if it is a street that I have driven on many times, such as my daily route driving to work, my experience of the street on foot is entirely different than how I experience it through the window of a car moving at 50 mph. You can become aware of something that you had passed by dozens of times without ever noticing; it is a way of rediscovering a place for the first time. Essentially, how you move through the city affects your relationship to it, and opens new possibilities for interacting with your environment. Stripped of all its symbolic trappings and show-biz frosting, what Disney World sells is a scrap of public realm free of automobiles – or nearly so, except for a few props. […] As well as being free of cars, of course, Disney World is also free of the bad relationships imposed upon things and people by cars. Since there are so few places of any size with this characteristic in America, the experience is understandably exhilarating. One effect of becoming a “local” at Disneyland was that I started caring about aspects of the park that I had not even noticed before. For example: how many visitors to Tomorrowland do you think give any thought to the color scheme of the area? I had visited many times without giving the issue any thought, but in the lead up to the 50th anniversary events Tomorrowland’s color scheme became a heated topic of discussion. When Disneyland opened, the colors of Tomorrowland reflected a 1950s space age conception of the future: whites, blues, greys. For some these colors were associated with rockets, space vehicles, and the sky itself. Others also associated the color scheme with a 1950s optimism about the future and promise of space travel. In the 1990s, the land was repainted with bronze and copper tones as part of a “future that never was” re-theming of the land. This change likely went unmarked by the majority of visitors, but to an invested few the color change represented an ideological shift from optimism to pessimism toward the space program. Interestingly, the area was repainted with the original color scheme in time for the 50th anniversary. This degree of awareness and concern for the built environment that urban planners, particularly vocal members of the New Urbanism movement, have been advocating for some time. The fact is, much of the built environment goes unmarked because it is so unremarkable. Blank walls and oppressive structures that repel rather than draw the eye. Caring about your environment and its condition can be a critical element of community engagement, and is often relevant factor in neighborhood change. I believe the key difference is a matter of investment: financial, personal, and otherwise. Unlike in Disneyland, citizens can benefit from being invested in their environment because they actually have a stake in it. Unfortunately, urban dwellers often take this for granted until it is too late and someone else invests in their community and stakes their own claim. In addition to his enthusiasm for designing environments and laying out transportation networks, there is evidence that Walt Disney dabbled in formal urban planning. In an article for Micechat.com, Sam Gennawey reports that Disney had one book on urban planning in his office: The Heart of Our Cities by Victor Gruen. Gruen advocated the “garden city” urban form that was very influential in the early 20th century. The urban planners and theorists working during this time had lived through a dramatic rise of industrial urbanism, and adopted a worldview characterized by a stark contrast between the pastoral, natural, and harmonious countryside, and the polluted, toxic, and chaotic city. These conditions contributed to a negative view of city life, and an anti-urban rhetoric that would dominate for much of the 20th century. The garden city movement was intended to right the imbalances of urban development and serve as a blueprint for harmonious cities. 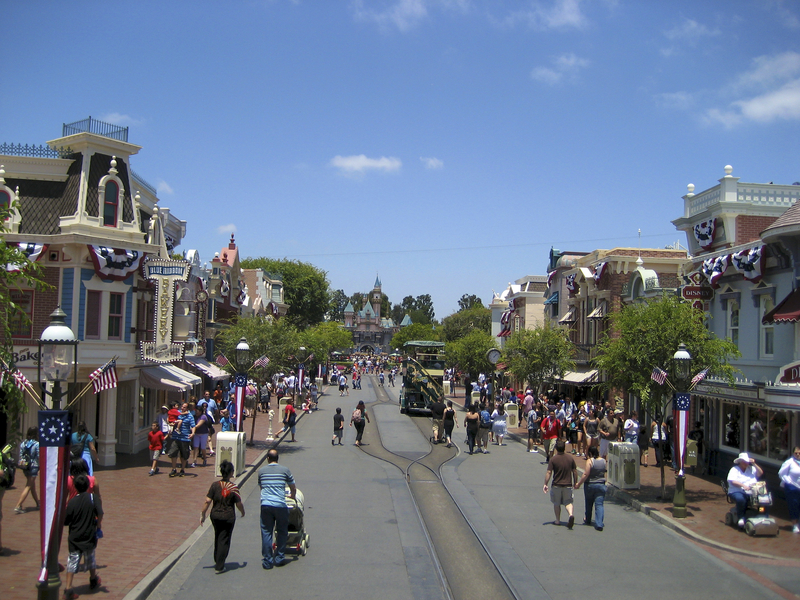 According to Gennawey, Gruen cited Disneyland as an example of ideal urban design. Indeed, comparing a map of Disneyland with the garden city layout reveals strong correspondences. Walt Disney apparently shared some of the negative conceptions of city life that held sway during that time. Walt had grown up in a small town in Missouri, and it is believed that the layout and architecture of Disneyland’s Main Street was strongly based on his hometown. Much of Disneyland’s theming and narrative suggests not only nostalgia for past phases of American society, but also an idealizing of rural and small town life. This nostalgia must have resonated with many Americans in the 1950s, because Disneyland was a huge hit with the public. Disneyland had been built on Anaheim orange groves, a mostly rural area. But once the park opened and crowds began flocking to the site, the area surrounding Disneyland quickly developed with businesses seeking to profit from the crowds. The cheap motels and other questionable enterprises that popped up outside the park dismayed Walt; he felt they marred the family friendly environment he had worked so hard to establish at Disneyland. Walt grew frustrated with his inability to control the urban development outside of his park, so he looked for a site where he could have control. Walt’s urban flight eventually led him to central Florida, where he clandestinely bought up swaths of land. This project was of course Walt Disney World, where Disney owned enough property they could build multiple theme parks and control the entire surrounding area. Now Walt could control what kinds of lodging and restaurants would be available to his guests outside the park, as well as make sure that even money guests spent out of the park would go to Disney. Curiously, the town of Celebration, FL is often cited as EPCOT’s legacy. Celebration is a “master-planned” community developed by the Disney company and connected to the Walt Disney World property. Aside from that, Celebration bears no relation to the utopian city of tomorrow that Walt envisioned. Celebration reminds me of another Florida town: Seaside, another master-planned community, designed by the firm of renowned architect Andres Duany. Seaside is often acclaimed as an exemplar of good design, ostensibly because it follows the tenets and ideals of the New Urbanism movement in urban planning. This may be the case, but I have never understood the praise heaped upon Seaside. In no way does it strike me as a place I would want to live. The town looks clean and well maintained, sure; but it seems fake and lifeless, as well. There is a reason that Seaside successfully stood in for a movie set in The Truman Show. I am not arguing that urban space needs to be chaotic or decrepit in order to be authentic; indeed, I think this is a common fallacy among urban enthusiasts and city dwellers alike. I am suggesting that attempts at “master-planning” and controlling urban space are inherently flawed, and are not conducive to thriving communities. Now, I recognize that neither Celebration nor Seaside are cities, nor are trying to design urban space. Nor am I criticizing the worth of New Urbanism; reading Duany’s book Suburban Nation was a revelatory experience for me, articulating and elucidating why I had found the built environment so unfulfilling throughout my life, and it is my favorite book on urban planning. Rather, I am citing these two well-known examples of master-planned communities to highlight and criticize the impulse toward total control of development. Planning is not urbanism entire, it is not the only means of understanding the city; focusing solely on planning cannot offer a complete perspective of life in the built environment, just as the city cannot be understood by considering only its architecture. In regards to the planning impulse in cities: I believe the modern era’s counterpart to the garden city is the smart city. Smart city rhetoric seems to me reminiscent of much anti-urban rhetoric, as well as early social scientific studies of cities from the early 20th century. The idea is that the city is a chaotic, entropic environment that needs to be reigned in and made harmonious. Richard Sennett has written beautifully on the value of the uncontrollable and unpredictable elements of urban life, what he calls “the uses of disorder”. Smart city rhetoric suggests that increased information (through smart sensors tracking data ranging from traffic flow to energy consumption throughout the city) will actualize the efficient, rational, and harmonious city. It is Big Data as solution to the urban problem. Aside from gentrification, Disneyfication is one of the most decried phenomena by residents of major cities today. Disneyfication refers to the proliferation of corporate and commercialized interests in urban space, often at the expense of local businesses or public interests who cannot afford to compete with such companies. The effect of this development is the spread of cheap and generic buildings and environment with no sense of connection to the unique place in which they are situated. You can walk into any chain drug store in Manhattan and never have to orient yourself to the layout, because it will be uniform across all the stores. Similarly, their storefronts will all have identical facades, leading to generic and generalized streetscape. The stores could exist in any city, there is no signifier connecting it to that specific location. This Disneyfication is a direct result of Disney’s successful theme park designs. It is possible to interpret the Disney narrative and see this as unintended consequences of good intentions: back in Anaheim, Walt was concerned that visitors to his park were being taken advantage of by unscrupulous hawkers and peddlers outside the Disneyland gates. Furthermore, he couldn’t vouch for the safety of enterprises undertaken off his property. Disneyfication could be seen as an outgrowth of this impulse to create “safe” spaces. In The Conscience of the Eye, Sennett wrote: “A city ought to be a school for learning how to lead a centered life.” It’s a beautiful ideal, and one that cannot come to fruition in a planned and controlled environment. In his essay “See you in Disneyland,” Michael Sorkin writes about the tourism and hospitality economy that developed around Disney World. Stating that at that time Orlando had more hotel rooms than Chicago or New York, he called Orlando “America’s capital of transience.” Disneyland is not a city; it is a resort, a playground for tourists. Guests pay to stay a while. This notion of city of transience, and city as tourist playground, has come to the forefront of city life today. As economic practices continue to adapt to the changes of post-industrial capitalism, prominent new forms of labor and services have emerged. One of the most prevalent are the on-demand services sometimes referred to as the “sharing economy”. This emergence is exemplified in the popularity of services like Uber, Lyft, and Airbnb. The advent of car-for-hire services like Uber and Lyft has been tumultuous for taxi industries in major cities. Taxi drivers have protested in cities worldwide. Some cities have banned the taxi alternatives outright. Meanwhile, Airbnb (which essentially functions as a hotel alternative; ostensibly, private homeowners and tenants rent out their homes as accommodation) has received scrutiny in cities suffering housing crises, especially New York and San Francisco. Critics of the service view as essentially turning real cities into Disneylands: displacing residents in favor of a revolving door of transient tourists willing to pay the price of admission. The issues raised by these services and their functions in urban economies lead to some fundamental questions the role of cities today. What is the city for? Should we view the city as a commodity? Or the city as service? For whom is the city? Who should the city be accountable to, and who should be accountable to the city? These are questions I am currently considering in depth in my research. My home city of Pittsburgh does not face the housing shortages or Airbnb saturation of larger cities, nor is the taxi lobby here as robust as in Philadelphia, but Uber has established itself in the city. Uber has selected Pittsburgh along with a number of other cities for a hiring surge of new drivers. At the same time, the company has partnered with Carnegie Mellon University to run a research lab in the city to develop robotic, autonomous cars that will eventually obsolesce and replace all the drivers they have hired. One more example of the preeminence of transience in the contemporary city. Recently the web site Theme Park Tourist published a retrospective on a former Disney World attraction: The ExtraTERRORestrial Alien Encounter. The attraction (I’ll use EAE for short) existed in the Magic Kingdom’s Tomorrowland from 1995 to 2003. I got to experience EAE sometime in the late 90s, and I remember it vividly. First of all, it was a golden era for Disney World’s Tomorrowland: the “New Tomorrowland” period, characterized by theming the area as a functioning futuristic city (complete with re-theming the People Mover as the Tomorrowland Transit Authority) and featuring such attractions as The Timekeeper, the revamped Astro Orbiter, and of course, EAE. The warning notices were effective: I was terrified the entire time we were in line. I remained terrified during both of the pre-shows. I was terrified entering the main show room: a theater in the round, with three concentric rings of seats facing the center of the room. And when, after taking a seat, a Disney crewmember lowered restraints onto my shoulders and locking me in, I was petrified. But then the attraction proper got underway, and something wonderful happened. The show was not nearly as unrelentingly vicious as I’d been imagining. Instead, it was a delightful combination of tongue-in-cheek humor, cutting edge special effects, and pop sci-fi storytelling. As the auditorium filled with screams (some genuine, some forced, some piped in through hidden speakers), I started laughing, and I continued laughing for the duration. The fears I had projected onto the unknown proved unfounded; the drama of a howling space beast breaking free of its cage and rampaging around the room devouring unwitting humans was nothing but good, clean fun. When it was over, I walked out grinning, and wanting to immediately get back in line for another go. That experience of an amusement park attraction nearly twenty years ago has remained a potent and positive memory. As far as Disney vacation memories go, it’s easily one of my best; a fond recollection of being thoroughly impressed by a real E-ticket ride. It’s also a dear memory of time spent with my father. Sure, sharing a theme park ride may not register as much of an experience for the zealously cynical and jaded, but for me there was something unquestionably profound in that experience: while in line I was afraid and wanted to leave, but dad knowingly did not indulge my overblown anxiety (rest assured, I was old enough to handle to EAE). Having gone through the experience, I found that the ultimate cause of my anxiety had been my own imagination, and came out the better for it knowing it had been worth it. Joy was the reward for having faced my fear. This is a terribly important life lesson, irregardless of the medium through which it is communicated. The fact that a theme park is an artificial environment doesn’t preclude the possibility for real, meaningful experience to occur there. The ExtraTERRORestrial Alien Encounter was closed in 2003 and overhauled into an attraction called Stitch’s Great Escape. In the new version, the berserk alien beast is replaced by a cute cartoon character who gets loose in the theater and farts in the audience’s faces. In fact, most of New Tomorrowland is gone. I have many other examples from various Disneyland attractions that have either been removed or altered. The disappearance of the Carousel of Progress; the addition of a Johnny Depp animatronic to Pirates of the Caribbean; the replacement of Star Tours with an entirely new version. Each of these irked me in some way. Perhaps you have your own examples. Changes like these can be affecting because they alter the landscape of our memories. If you return to those places, you can’t help but remember what used to be there, or how it was before. Such changes are not always experienced negatively, but they are noticed. No matter how long you have been here, you are a New Yorker the first time you say, That used to be Munsey’s, or That used to be the Tic Toc Lounge. That before the internet café plugged itself in, you got your shoes resoled in the mom-and-pop operation that used to be there. You are a New Yorker when what was there before is more real and solid than what is here now. Obviously, the maxim about “the only thing that is constant” does not apply only to cities, or to Disneyland. It is a universal precept, but one that can be difficult to accept, especially when it affects our pasts and personal histories. The city is change. Cities are not static, but constantly changing; that dynamism is integral to their vitality.